Christmas is about being with family and friends and what better way to spend time together than in a luxury holiday home? 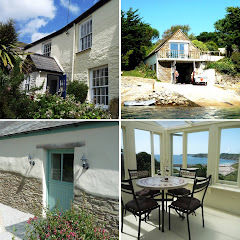 The Boathouse is a very special converted sail loft fronting directly on to the Percuil River. With exposed beams and a ship’s bunk style bed, the property has stunning views over the water both from the full width patio doors and railed balcony. Five people can be accommodated in one bedroom, on a sofa bed and fold out bed. The Nook is a sensitively restored old fisherman’s cottage. Sleeping 6, it is great for windswept walks and has a cosy log burner to warm up by. It has thick walls and low beams as well as modern bathrooms and a fully fitted kitchen. Allows dogs. Downholm, sleeping 12, is a luxurious detached house right on the seafront in St Mawes on the Roseland Peninsula. It has exceptional uninterrupted panoramic views across the harbour, 6 bedrooms, a games room and spacious living areas. Please visit our website for a full list of Luxury Holiday Homes in Cornwall. You don't have to worry about getting your kids to exercise because bunk beds full over twin for them to repeatedly climb up those ladders and slide their way down can prove to be a real work out.